About a year ago, I got a cell phone for the first time in my life. I’m not sure how I succeeded at steering clear of them for so many years or even why it felt so important to me, though my list of reasons was long and surely not unfounded. I am a person who feels strongly about certain things and can grip onto a stance and not let go. Mostly, that quality has been a good thing, but sometimes it gets petty and perfectionistic and more harmful than good. I think this particular issue reached the point where I was digging my heals in, squeezing my eyes shut, and making silly noises while keeping fingers planted firmly in my ears to keep out any voices conflicting with my own choice. I am glad that I didn’t have a cell phone for so long. It meant that I got to be present with the people standing in front of me in an uninterrupted way. It meant time just watching my children play or jumping in and playing with them at the park. It meant that I wasn’t instantly available to anyone with my phone number. This meant the precious time with my young children was protected in a way. It allowed me to make space for phone calls and social media in planned pockets of my life instead of an open door policy throughout my day. Of course it took a little extra planning to be without a cell phone – setting times and locations ahead of time, writing down directions on little slips of paper, and waiting until I got home to call or email. But, I can also say that I honestly rarely needed one or felt inconvenienced. 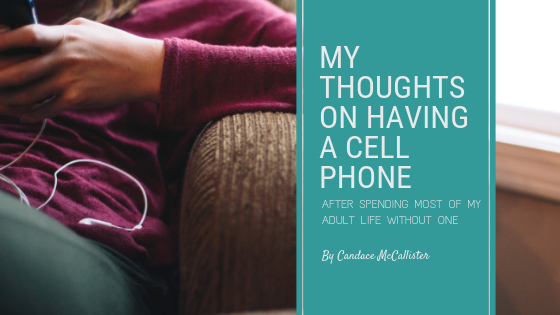 The years without a cell phone coincided with the years that I was home with my children and worked only minimally outside the home. So, the cell-phone-free season of my life automatically equates in my mind with the bliss of simpler schedules, less need to hurry, slow cooked meals, lots of time outdoors, and long talks with other mamas in my building and at the park. Deciding to get a cell phone was not a quick an easy answer to practical needs and life stage transitions, though. It was, as it is with any decision that conflicts an internal standard of mine, an existential crisis of sorts. I agonized about it for weeks. I cried. I argued with my husband. I berated society, questioned my own ability to live differently and to live up to my ideals. I was at times melancholy, at times resigned to it, and at times spitting mad. It’s okay. I can laugh about it now. You can feel a little compassion for my husband in this moment. This is not an isolated incident – getting a second car, deciding whether or not to accept a job offer, choosing to give my kid antibiotics – they are all, for me, decisions fraught with meaning and weight and requiring a good deal of emoting. But, I finally decided to get the phone. All my agonizing and questioning and list-making had finally settled into an actual decision. You may wonder, “What were the deciding factors?” One thing, really: Friends. I mean, the phone would be helpful for my business and for getting around town (directions have never been my strong suit). But, really it boiled down to friends. We had moved to a new city a couple of years earlier. We’d moved out of a close-knit community and neighborhood and apartment building, and into a regular (I guess??) city where people kept to themselves more and made appointments to see each other or have a playdate instead of just running into each other or knocking on your door. While I’d been living happily among like-minded, low technology friends, the rest of the world had gone on without me. Now, people preferred not to call or stop by; they would text each other about the day’s events or about meeting at the park. And I was not included…not out of spite, mind you – just because I didn’t fit into the system. I prayed and felt a peace about my decision. EMF’s and addictive qualities and excessive time looking at screens and the inevitable interruptions aside, I would trust that I could make good boundaries and make new connections with people and use this tool for my work. I announced my decision to Josh and the children, still conflicted inside but willing to move forward. He was angry and wanted my husband and I both to give up having cell phones. He worried about the health effects and the way it might change our family. We had long talks and prayed together several times. And, he came around…reluctantly…he and his sister both claiming the role of tiny police officers in keeping me accountable to good phone boundaries. Please tell me you’re laughing and not thinking we’re crazy at this point. You have to understand that we have spent a good portion of the last decade around hippies and Mennonites and slow food enthusiasts and sustainable farmers and even a few anarcho-primitivists. Our kids have listened in on conversations analyzing the loss of connection and support in our society and the need for simplicity and community from the time they were wrapped in cloth diapers and riding in a mei tai on my back. They have seen the colorful beauty of people brave enough to live differently and to resist the average resigned “what can you do?” attitude. They know there is more than busy schedules and people staring at screens and sitting at desks and eating food from boxes or greasy bags. They know there is beauty and meaning in the slow ways, in communing across generations, in being in the wild, and they often envision a future that is different. So, really I’m proud of them and their passion moves me and gives me hope. They are not the kids you hear about begging for cell phones of their own to snapchat with their friends or play video games; they see a bigger picture. And, that is worth celebrating. So my heart burst a little in that time, and I could smile and laugh and hear them out. And then, I got the cell phone anyway. Because, isn’t it just like that sometimes? I mean, the final outcome is what it is, but I’m still glad that we processed and that it mattered that much to us. I think that will make us more aware and help us to have better boundaries and to stay open to making a different decision down the road. And, now here we are, a year later with this new-to-us cell phone in our lives. It’s been okay, really. I obsessively keep the phone in “airplane mode” as much as possible. I keep the thing away from my organs. I insisted on naming it “number 8,” because it shouldn’t have a loveable name – it’s just an object, a tool. I don’t use it like most people do. If you call, I probably won’t answer, but I do check it throughout the day for texts/messages. It’s gotten stolen once, and I had a precious cell-phone-free week that I relished. For now, I’m keeping it in my life. It’s helped with scheduling clients, with navigating directions, and with staying in touch with people I love. And y’all. It has all been worth it for the friends. I mean, having this phone has meant that people see something funny or need to vent and they TEXT me about it. They invite me to the park or to lunch. I have several new deep friendships to show for it. And, it’s helped my kids in the friends department, too. The cell phone has meant it’s much easier for me to set up playdates and parties. We’re all more used to it now, but I don’t think any of us take it for granted or think we couldn’t live without it. It’s a tool, and there are more important things. And, living differently and faithfully and closer to our ideals…well, that is something we continue to work out in a hundred different ways. And, if I’m honest, I think there are moments when it’s actually happening.